You can make by yourself the runny food for baby birds by mixing the below with water. But due to the baby birds’ immune system isn’t fully developed. excellent hygiene is required when handling the replacement food like dog food and chicken food. Baby rice cereal is OK, but some baby formula containing lots of zinc and/or sugar should be avoid. 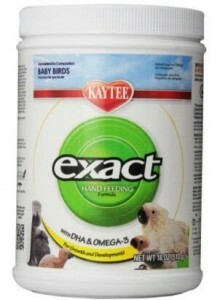 For your convenience and the best result, a commercial hand-feeding formula is mostly recommended. After the food is decided, you still need an eyedropper or a disposable syringe with plastic tip for gently pushing the food into a baby bird’s mouth. Determine quantity of formula and water based on the water-to-solid ratio according to the age of baby birds or the package instruction if there is such a detail, the runny food should be very thin for a new born, the solid levels should be increased with the growth of the baby. Put the formula into a bowl, pour hot water into the formula, mix and stir well, wait until it cool to the temperature range between 100 and 108 degrees Fahrenheit or according to the package instruction. 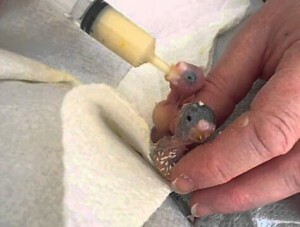 Put the baby parrot on an easy-to-grip surface like a cloth or a tissue paper, if it’s a newborn, you need to grip the bird gently with a support to its head, use the tip of the eye dropper or syringe to touch the top side of it’s beak to elicit the feeding response, extend the tip a bit deeper when the baby parrot open its beak, then release the food slowly to let the baby swallow the runny food. 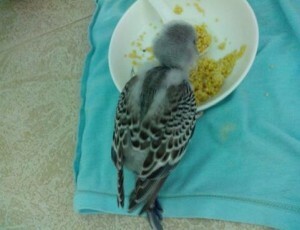 When the baby grow up with feathers, make the food not runny but humid, put the food into a small bowl placed before the parrot, train the parrot to eat food by itself.